Anemone quinquefolia.Les Mehrhoff.discoverlife.org. (Accessed 3/2014). Anemone quinquefolia is a perennial herb to 20 cm tall (usually less), colonial from a slender rhizome. Leaves alternate, palmately compound, 3-5 leaflets, wedge-shaped, coarsely, unevenly toothed. Flowers white, to 2 cm wide, sepals 5 (petal-like), no petals, blooms, April-May. 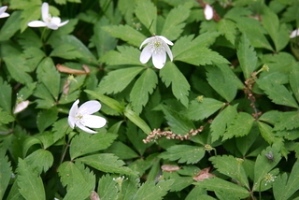 Habitat: Rich, moist, open woods.